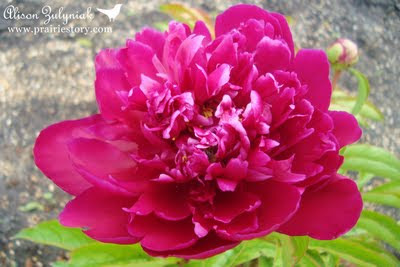 My magenta peonies opened today, which reminded me of some peony tips that I thought I'd pass on to you! 1. Plant them in sun. 2. Don't plant them too deep or else they won't bloom. 3. Don't cut them down in the fall. If you do you run the risk of moisture going down the stems into the heard of the root ball, freezing and damaging it. Just leave them until spring to clean up the dead leaves and stems.